We will be using this blog to record our adventures over the course of the year! Instead of backtracking (we will save that for another time), we want to tell you all about the adventure we went on last week! Udi, the Israeli intern at Daniel’s school, took us on a tour of the Muslim Quarter on Tuesday afternoon. We visited the Muslim quarter on our last trip to Israel – Jen insisted we go to the Via Dolorosa and follow the path that Jesus walked on his way to his crucifixion, ending at the Church of the Holy Sepulchre. 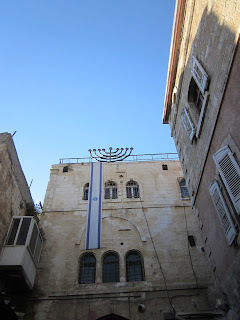 We hadn’t planned on returning to the Muslim Quarter (one “Christian pilgrimage” was enough for us), however we were intrigued to see what an Israeli-native had to show us! We entered the Muslim quarter through the Damascus Gate. Udi advised us to speak English as opposed to Hebrew while in the Muslim Quarter. He explained that language is very political here and it is better to be visiting as an American as opposed to an Israeli. It was up to us whether or not to remove any Judaic symbols. Jen didn’t have any on, however she did go in not wearing a jacket, felt uncomfortable and quickly decided to cover her shoulders. First stop was the tahini plant. I of course was the first to volunteer to try the stuff. It is not really my thing (tasted like gross sesame-butter) and Daniel was not a huge fan either. Daniel bought some anyways from the old man because he allowed all 15 of us cram backstage into his tahini operation, interrupting his work. You would think with modern technology there would be a better/more efficient way to make tahini, but I guess not! Old stones are used to grind the sesame seeds. There are obviously no health codes to adhere to in the Old City. Tahini was all over the walls and the ground was covered in sesame seeds, making it really slippery to walk on. We also checked out an Austrian Hospice, which I think is one of the Old City’s best-kept secrets. If you go on the roof, it has one of the most beautiful views. It is pretty funny seeing century-old buildings with satellite dishes placed on top. One of the things our group discussed on the rooftop of the Austrian Hospice was how we feel about Jews living in the Muslim Quarter and obtrusively hanging Israeli flags out their window (this is done mainly for political reasons) and also about buying things in the Muslim Quarter (as opposed to only purchasing from Israelis). Some felt that everyone is just trying to make an honest living and you are simply contributing to the conflict by refusing to buy from Muslims. Others simply would rather spend their hard earned shekels on Israeli goods. Something to also think about is that on our way to the Austrian Hospice, there was a group of small children that started throwing rocks at us. Our Israeli tour guide was shocked by this. It is difficult to decipher whether these kids were just being kids or if they have been brought up to truly hate our people. Daniel and I don’t think they were trying to hurt us. There were definitely much bigger things they could have thrown. What do you think? We did find some delicious things in the Muslim Quarter. We shared some homemade baklava and Daniel bought some fresh Turkish coffee. Whether or not we are planning to continue to shop here – we are not sure. One thing I do want to go back there for is for the hummus. This place Udi showed us makes a huge vat of it in the morning and when it’s gone, they close down shop. Unfortunately, since we stopped by in the evening, they were already closed for the day! Our last stop was Notre Dame, which is a new hotel right outside the Muslim Quarter. Regardless, on the top floor of this church turned hotel, they have an amazing wine and cheese restaurant that overlooks all of Jerusalem. You can even see Jen’s school, Hebrew University, on the top of Mount Scopus! Udi said he would kill us if this place started getting crowded; so don’t go spreading the word! Daniel handpicked all of the cheeses that we ate. We felt right at home here! It was also nice getting to know a few of the other students in Daniel’s program. We essentially just took you on our tour of the Muslim quarter. Hope you enjoyed the adventure. Many more to come! Keep these entries coming!!! I love reading them :) I'm so glad you guys are having such a great time and love learning about your experiences!! More More More!!! Great blog, excited to hear about your adventures. Thanks Google Maps for the Adventure!